Net neutrality proponents have won their most significant political victory yet in a yearslong effort to ensure that internet service providers are prevented from manipulating traffic on their networks for profit. But any celebration will be short-lived. The House passed on Wednesday a Democrat-led bill that restores the net neutrality rules put in place by the Federal Communications Commission under the Obama administration. 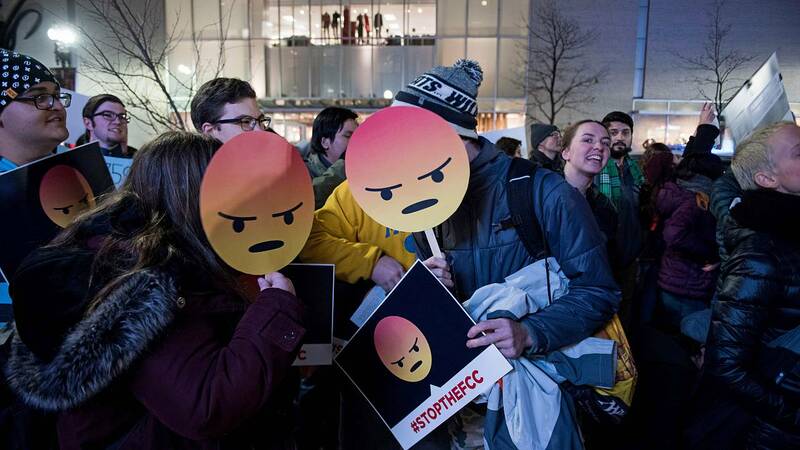 Those rules were undone by the FCC under President Donald Trump, leaving the Federal Trade Commission to regulate internet providers. The bill passed the House on an almost entirely party-line vote, 232-190. While the vote is a historic moment for internet regulation, the bill has little chances of moving forward. Senate Majority Leader Mitch McConnell, R-Ky., said Tuesday that the bill would be "dead on arrival" in the Senate, and the White House on Monday put out a statement threatening to veto the bill. Net neutrality is a principle that all lawful traffic traveling over the internet should be treated equally. While most of the companies that operate internet infrastructure have generally abided by that concept, net neutrality advocates have warned that internet providers that control the "last mile" — the connections by which consumers access the internet — could charge other companies for "fast lanes," a move that would put competitors at a disadvantage and limit the ability of entrepreneurs to compete. Democrats in recent years have mostly aligned in support of net neutrality, while Republicans have opposed it, citing concerns that the rules would stunt investment in internet infrastructure and give the government too much power over the internet. While tech policy issues such as net neutrality have been primarily left to government agencies like the FCC, the House vote adds to growing discussion among local and national politicians of the need for new legislation to address the unique issues and challenges posed by technology companies. Reactions to the vote also broke down primarily along party lines. FCC Chairman Ajit Pai, who oversaw the FCC when it voted to overturn the Obama-era net neutrality rules, said in a statement that the bill "is a big-government solution in search of a problem." "The Internet is free and open, while faster broadband is being deployed across America," Pai said. "This bill should not and will not become law." Jessica Rosenworcel, one of two Democratic commissioners FCC commissioners, said in a statement that the bill "gets right what the FCC got so wrong." She also cited public support that has been repeatedly referenced by Democrats, with numerouspollsfinding broad backing for net neutrality rules. "The momentum around the country—from small towns to big cities, from state houses to court houses, from governors' executive actions to today's action in Congress—is proof the American people are not done fighting for an open internet. I'm proud to stand with them in that fight," Rosenworcel said.